The Bosch SP0F000001 is a Sport ST 2" Electrical Water/Oil/Trans Temperature Gauge. It features a 100-280 degree Fahrenheit with a 90 degree sweep. An electrical sweep mechanism features an air core movement. 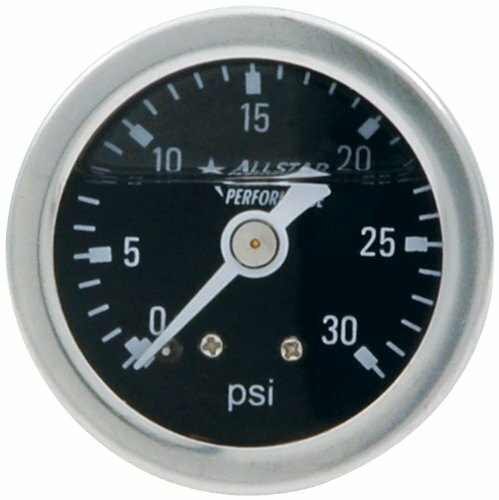 The gauge is a standard 2" dial for a 2-1/16" opening. Through dial lighting with night pointer illumination and electrical temperature sender included. The Sport ST Line is designed to match modern car interiors with a subtle metallic body and smooth exterior finish. Bosch is known for precision, engineering, and innovation. Add style and you have the first-ever line of Bosch gauges, including replacement tachometers, speedometers, temperature and pressure gauges for all applications. Bosch Branded Gauges represent the latest in design following our 100+ year history of Automotive, Industrial, and Racing products. 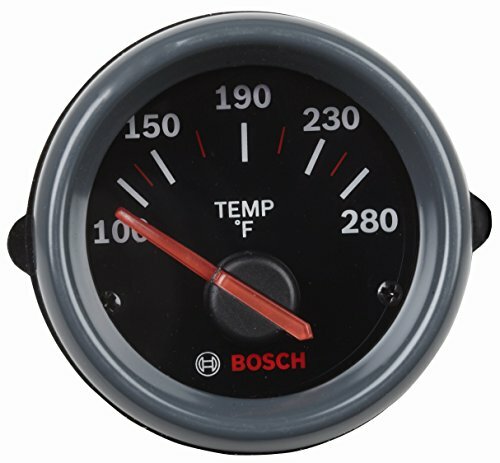 The Bosch SP0F000054 is a Style Line 2" Triple Gauge Kit. It features Oil/Water Temperature SP0F000053, Electrical Voltmeter SP0F000051, and Mechanical Oil Pressure SP0F000052 gauges. The gauges are 2" black dials for a 2-1/16" opening and features black bezels with a removable black mounting panel. Includes 72" high temperature nylon tubing with 1/8" and 1/4" NPT thread fittings. Also includes mounting hardware and 12 volt internal lighting. Only for 12 volt negative ground systems. The Style Line features a clean easy to read look with a bright pointer against a white or black background. Bosch is known for precision, engineering, and innovation. Add style and you have the first-ever line of Bosch gauges, including replacement tachometers, speedometers, temperature and pressure gauges for all applications. Bosch Branded Gauges represent the latest in design following our 100+ year history of Automotive, Industrial, and Racing products. 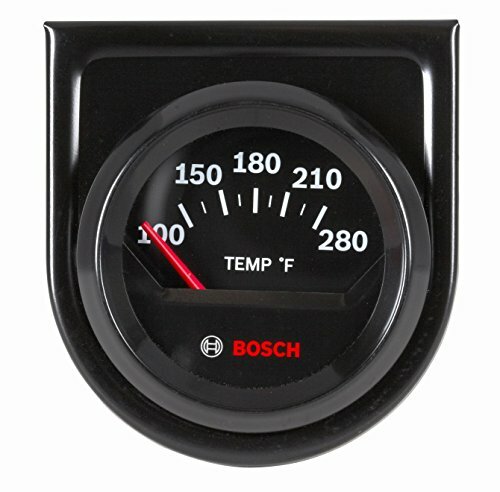 The Bosch SP0F000046 is a Style Line 2" Triple Gauge Kit. 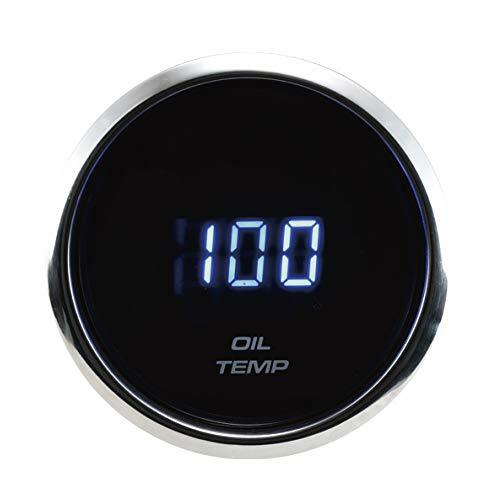 It features Oil/Water Temperature SP0F000045, Electrical Voltmeter SP0F000043, and Mechanical Oil Pressure SP0F000044 gauges. 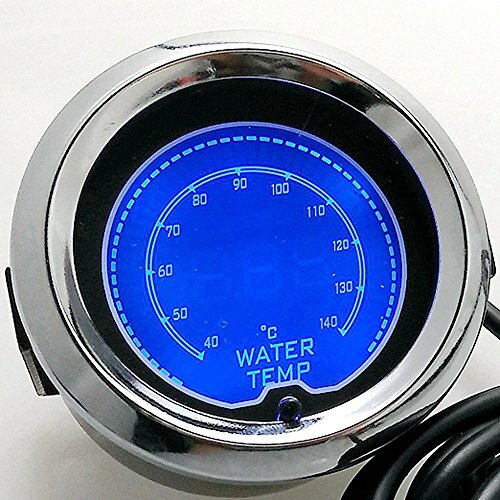 The gauges are 2" white dials for a 2-1/16" opening and features chrome bezels with a removable chrome mounting panel. Includes 72" high temperature nylon tubing with 1/8" and 1/4" NPT thread fittings. Also includes mounting hardware and 12 volt internal lighting. Only for 12 volt negative ground systems. The Style Line features a clean easy to read look with a bright pointer against a white or black background. Bosch is known for precision, engineering, and innovation. Add style and you have the first-ever line of Bosch gauges, including replacement tachometers, speedometers, temperature and pressure gauges for all applications. Bosch Branded Gauges represent the latest in design following our 100+ year history of Automotive, Industrial, and Racing products. 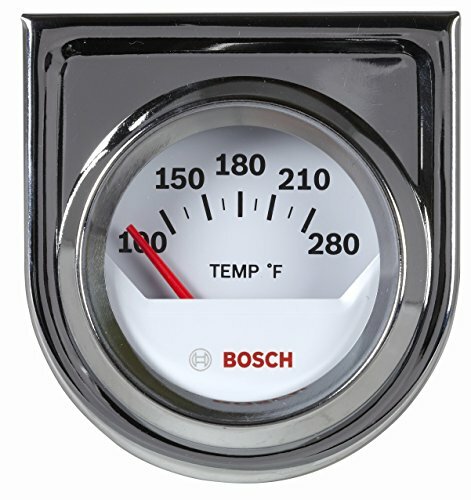 The Bosch SP0F000049 is a Style Line 2" Electrical Water/Oil Temperature Gauge. It features a range of 100-280 degrees Fahrenheit. Requires hook up wire. Includes sending unit with 1/8" NPT thread and 1/4", 3/8" and 1/2" adapters. The gauge is a standard 2" black dial for a 2-1/16" opening and features a black bezel with removable black mounting panel. Includes mounting hardware and 12 volt internal back lighting. Only for 12 volt negative ground systems. The Style Line features a clean easy to read look with a bright pointer against a white or black background. Bosch is known for precision, engineering, and innovation. Add style and you have the first-ever line of Bosch gauges, including replacement tachometers, speedometers, temperature and pressure gauges for all applications. Bosch Branded Gauges represent the latest in design following our 100+ year history of Automotive, Industrial, and Racing products. The Bosch SP0F000039 is a Style Line 1-1/2" Mini Triple Gauge Kit. It features Mechanical Water/Oil Temperature, Electrical Voltmeter, and Mechanical Oil Pressure gauges. Includes 72" high temperature nylon tubing with 1/8" and 1/4" NPT thread fittings. Also includes mounting hardware and 12 volt internal lighting. 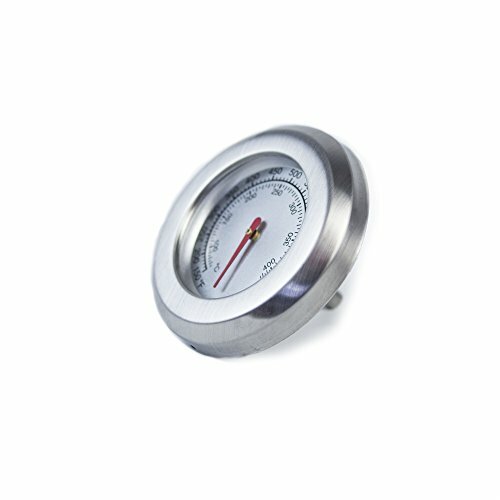 Popular Mini gauges packaged conveniently for easy installation. Only for 12 volt negative ground systems. The Style Line features a clean easy to read look with a bright pointer against a white or black background. Bosch is known for precision, engineering, and innovation. Add style and you have the first-ever line of Bosch gauges, including replacement tachometers, speedometers, temperature and pressure gauges for all applications. Bosch Branded Gauges represent the latest in design following our 100+ year history of Automotive, Industrial, and Racing products. Bronze bourdon tube 270 degree sweep movements and durable nylon gearing have made these rugged and long lasting gauges a proven high performance favorite for over 25 years. 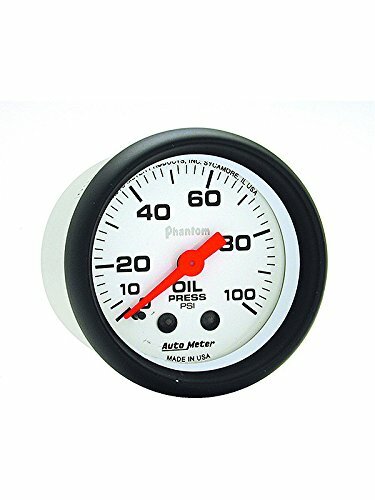 These mechanical gauges require no electrical power for operation making them an ideal choice for vehicles with no or low powered electrical systems. The Bosch SP0F000024 is a Custom Line Triple Gauge Kit. 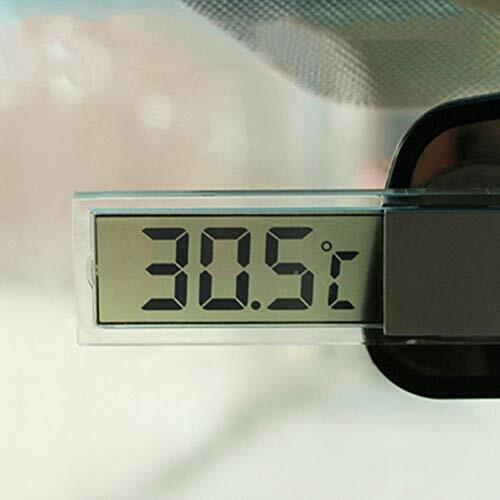 It features a combination of Oil, Volts, and Temperature in one matching black panel and features the same scales as standard Custom Line gauges. Includes matching mounting panel and 12 volt internal back lighting. This gauge kit allows for custom under dash installation without additional items to purchase. The Custom Line features a clean easy to read look with white line styling against a black background. Bosch is known for precision, engineering, and innovation. Add style and you have the first-ever line of Bosch gauges, including replacement tachometers, speedometers, temperature and pressure gauges for all applications. 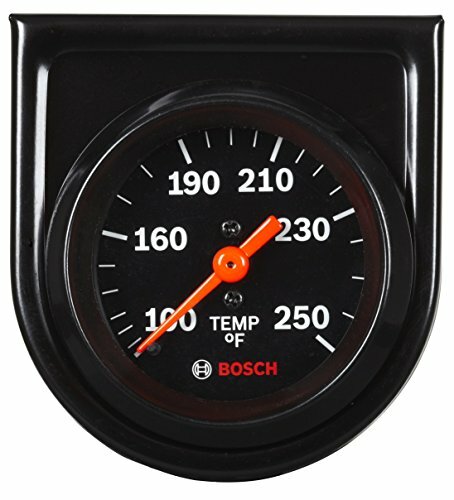 Bosch Branded Gauges represent the latest in design following our 100+ year history of Automotive, Industrial, and Racing products. The Bosch SP0F000037 is a Style Line 1-1/2" Mini Triple Gauge Kit. It features Mechanical Water/Oil Temperature, Electrical Voltmeter, and Mechanical Oil Pressure gauges. Includes 72" high temperature nylon tubing with 1/8" and 1/4" NPT thread fittings. Also includes mounting hardware and 12 volt internal lighting. Popular Mini gauges packaged conveniently for easy installation. Only for 12 volt negative ground systems. The Style Line features a clean easy to read look with a bright pointer against a white or black background. Bosch is known for precision, engineering, and innovation. Add style and you have the first-ever line of Bosch gauges, including replacement tachometers, speedometers, temperature and pressure gauges for all applications. Bosch Branded Gauges represent the latest in design following our 100+ year history of Automotive, Industrial, and Racing products. The most important of this series uses a pin-type installation, no cumbersome steps, this is definitely what you want. It included in the packaged oil temp sensor(Thread size: 1/8 NPT), power harness, screw bracket, O-ring, installation manual. Includes 6 ft. nylon tubing with 1/8 NPT fittings. The Bosch SP0F000017 is a Style Line 1-1/2" Mini Triple Gauge Kit. It features Mechanical Water/Oil Temperature, Electrical Voltmeter, and Mechanical Oil Pressure gauges. Includes 72" high temperature nylon tubing with 1/8" and 1/4" NPT thread fittings. Also includes mounting hardware and 12 volt internal lighting. Popular Mini gauges packaged conveniently for easy installation. Only for 12 volt negative ground systems. The Style Line features a clean easy to read look with a bright pointer against a white or black background. Bosch is known for precision, engineering, and innovation. Add style and you have the first-ever line of Bosch gauges, including replacement tachometers, speedometers, temperature and pressure gauges for all applications. Bosch Branded Gauges represent the latest in design following our 100+ year history of Automotive, Industrial, and Racing products. Gauges are 1-1/2" diameter with stainless steel cases and bezels. Available glycerin-filled, dry, or engine turned with brass internal parts and 1/8"NPT connections on back. Fashionable appearance, easy to install. This Dyna-Glo temperature gauge is for use on Dyna-Glo grill model dgp350snp-d, dga480bsp-d, dga550ssp-d and dga480ssp and master forge models mfa350bnn/mfa350bnp/mfa350cnp/mfa480bsn/mfa480dsn/mfa480bsp/mfa480dsp/mfa480gsn/mfa480gsp/mfa550cbn/mfa550cbp. Electrical Type,Diameter: 52mm, 2 1/16"